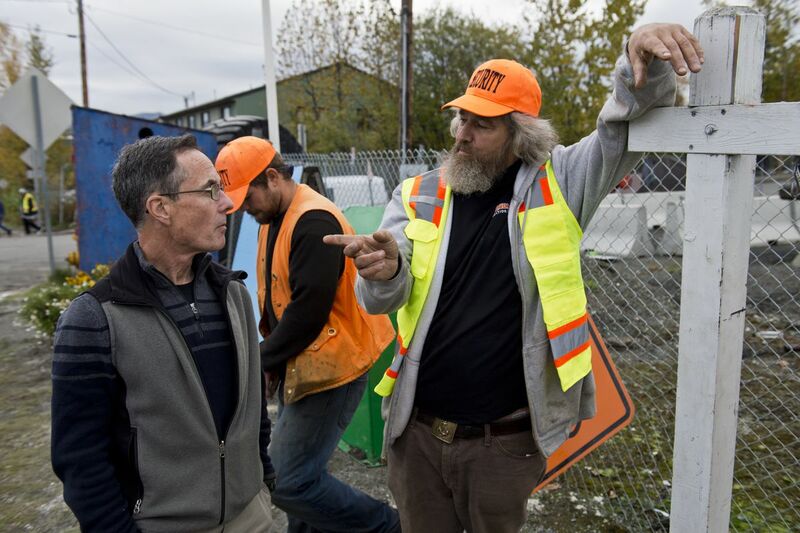 Ron Alleva, the Anchorage auctioneer who has waged a long campaign against the homeless shelter and soup kitchen that operate next to his business in the Ship Creek area, has again sued the city and nonprofits for causing what he says is deep damage to his business and family. It's the latest in a string of legal entanglements between Alleva and the city, which have led to several payouts of taxpayer money in his favor in recent years. The new lawsuit, filed April 17 in Anchorage District Court, is largely identical to one Alleva filed in 2012. That suit resulted in a $30,000 cash settlement, records show. In the new suit, Alleva stands to get a lot more. Alleva is trying to recoup economic losses as he prepares to shut down and move much of his auction business along East Third Avenue, he said. "They're suffocating me emotionally, spiritually, physically, financially," Alleva said in a phone interview. In the lawsuit, Alleva claims "urination and defecation … thrown bottles, strewn trash and the frequent scaring" of customers and tenants had led to mounting operating losses since 2011, including a $362,000 loss in 2016. The suit names Catholic Social Services, the parent organization of the Brother Francis Shelter; Bean's Cafe, a separate nonprofit; and their longtime landlord, the city of Anchorage. Alleva made similar claims in 2012. This time, Alleva is also claiming "inverse condemnation," alleging the city and nonprofits had effectively condemned his property by failing to control illegal activity and other bad behavior by some shelter clients. Officials with Catholic Social Services and Bean's Cafe declined to comment Tuesday. City attorney Rebecca Windt-Pearson said the city was still evaluating the lawsuit. But Windt-Pearson noted new efforts by the city to better manage the area around Brother Francis Shelter and Bean's Cafe: A team of police officers, paramedic firefighters and social workers has been stationed there since January, in hopes of reversing a flood of non-emergency 911 calls over the years. Between 2010 and 2017, the number of emergency responses to the area more than doubled, data show. "The presence of emergency personnel down there on an ongoing basis, I think, has made a considerable difference recently," Windt-Pearson said. Officials say the new strategy, aimed at finding permanent solutions to some of the city's more intractable problems, has led to a noticeable reduction in calls to police and emergency responders, cited by Alleva in the lawsuit. Alleva said the city had tried to clean up the area but he hadn't noticed much of a difference. He said he spent many hours this past weekend picking up garbage. A fixture at public meetings and at City Hall, Alleva is known for staging public demonstrations to air his grievances. In September, Alleva blared train horns, alarm bells and sirens from his auction storage yard and put up a sign declaring to shelter residents that "THE PARTY IS OVER," sowing confusion and anger among people who were camping on the street. In both the 2012 suit and the most recent lawsuit, Alleva said he wants the shelter and soup kitchen to shut down or move. Alleva has tangled in court with the city in other ways over the use of his land. In November, Alleva sued the city to assert trees had been improperly cut down on a property he was leasing to Municipal Light & Power. Just last week, the city agreed to pay $5,000 to settle that suit, records show. The city split the 2012 settlement with Catholic Social Services and Bean's Cafe, according to a copy of the settlement agreement. In the new lawsuit, the city could be on the hook for damages that include the fair market value of Alleva's properties. At the same time, Alleva said he is planning to massively shrink the footprint of his auction business. A statement to news media said Alleva plans to liquidate the auction yard between April and June. "I'm going to shut down at that location," Alleva said. "We're just going to streamline to a different location." Over the past year, the city tried to work with Alleva on selling his properties to a nonprofit. Robin Ward, the city's chief housing officer and a longtime real estate manager, said she stepped in to help broker a deal. The city split the $6,400 bill with Alleva to appraise his three properties next to the shelter and soup kitchen, Ward said. But Alleva did not agree with the appraiser's assessment, and the effort has stalled, Ward said.